What furniture is suitable for small living room? The value of housing in modern interpretation is notperceived solely in terms of "my house - my fortress." Now, every owner of the apartment is committed to interior design provides the maximum aesthetic pleasure for him and his guests. Even if the size of the apartment is small, this disadvantage can be skillfully beat literate and interesting design. Professionals know a lot of secrets, which they use a room of 17 m2 It can easily be turned into an attractive and cozy nest. The basic rule - to seek to release as much space, placing furniture against the walls of the room, leaving the middle free. Finishing material is best to choose lightshades. You can use wallpaper with small unobtrusive vertical pattern or ornament. Alternatives - paint or decorative plaster. In this case the walls should not be too many external overloading accessories. For pictures and photographs not burden the interior, they decorate the scope of bright colors. Against the background of bright walls will look great darker furniture. Lovers of bright color accents may be issued in the appropriate scale any one segment. 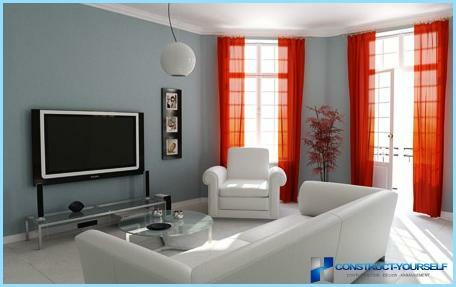 Remember that you need to adhere to the harmonious combination of household items in the room in terms of colors. 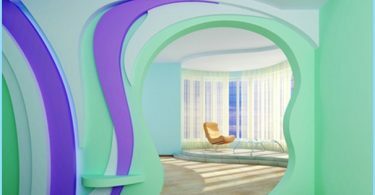 Excellent push the boundaries of space and bringin its interior freshness and space solutions such as wallpapers with the outgoing scenery far as the forest thickets, open sea, etc. A similar effect can be achieved by causing a wall drawing of a blue sky with fluffy white clouds, smoothly passing to the ceiling. The room is 17 m footage2 standard cast-iron batteries look too bulky. Rational to replace them with modern compact designs that look virtually unnoticeable. 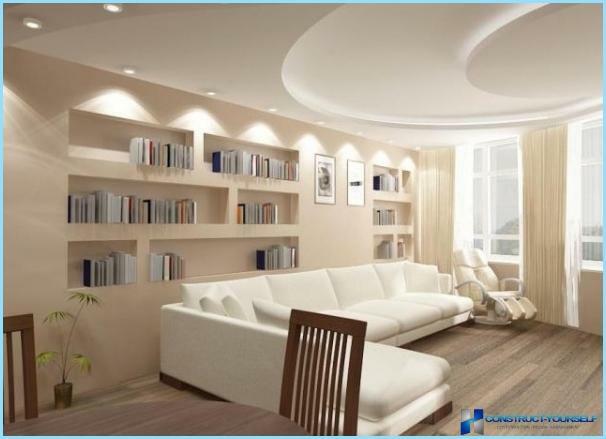 Ideally, the ceiling will create a finisha feeling of spaciousness and light. The best solution - it's glossy stretch ceiling with a reflective effect, like a mirror. Properly selected and installed lighting will provide a spectacular appearance. Especially good solution will ceilings in a room with low ceilings. Decorative paintings represented a huge amount of colors, not necessarily choose light colors variations, the perfect solution would be a combination of several colors. Much attention should be paid to design the floor. The coating must be of high quality and durable, because the load on it is always in the living room is high enough. Deciding to divide the room into zones, it is possible to combine different options of flooring, such as laminate flooring with carpet. room size 17 m2 - Not so little, so it is quite possibledivided into functional areas. This effect will achieve varying color shades also help delineate the space artificial columns or cupboards. The partition can be made in the form of oil paint the walls, complemented by glass shelves, which will be useful functional solution to accommodate a variety of decorative items, books and all sorts of little things. 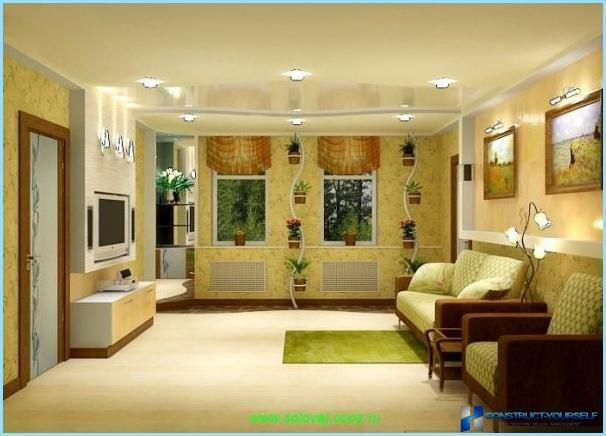 If the shape of the room close to the square, it isallowed to place the furniture in the center of the room. This not only makes it visually more, but will create additional functional zone, for example for reading. The basic rule when you make such a design - to define the subject or part of a room, which will become the center of the interior. For details of this will line up the rest of the composition. Often the semantic center of the main living room stands a TV, and the rest of the room furnishings - sofas, chairs, coffee tables, cabinets, lining up around it. scope and the lack of spare parts and fanciful. Minimalism - a laconic atmosphere consistingexclusively of essential items. 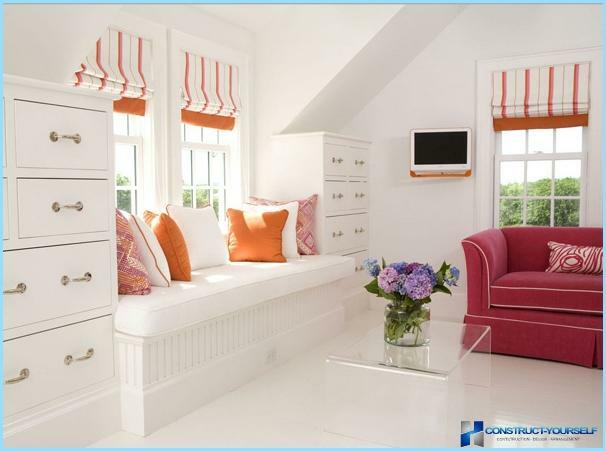 This preference is given to the interior of pastel colors, always present mirrors and mirror surfaces. For it is not peculiar to the use of massive and heavy furniture, carpets and huge complex of textile drapes. Japanese visual style - a vivid embodiment of the minimalist trend. 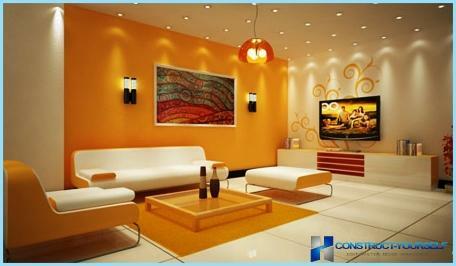 Hi-Tech is a perfect solution for those whoIt is committed to the stylish design of the room. In a small room is always advantageous to look plastic, glass, metal, successfully creating the illusion of spaciousness. As the lighting used spotlights, evenly covering all corners of the room. Color interior design in high-tech style - bright beige tones in the background, and a striking blue and yellow, orange and black or silver accents. In the room, each piece of furniture, all the parts and accessories should have a clear functional purpose, everything should be in moderation and in their places. Translucent cabinet fronts, furniture with metal inserts - all of it is typical for high-tech style. 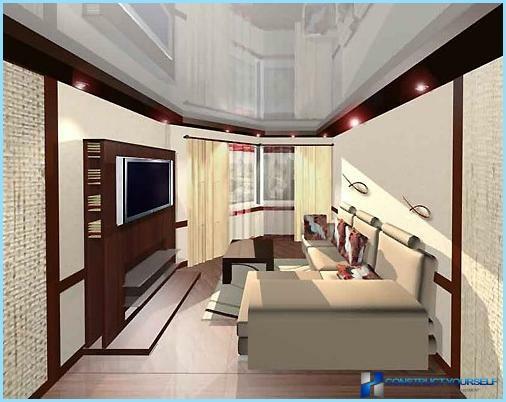 For the interior design of 17 m2 you need to choose furniture and elegant nonmassive. A large number of furniture in this room would be inappropriate, therefore it is best to do the minimum. The most suitable solution - open shelves andracks, narrow cabinets with mirrors and glass facades. The greater the number of shelves, the better able to visually horizontal baffle height pull a small room. 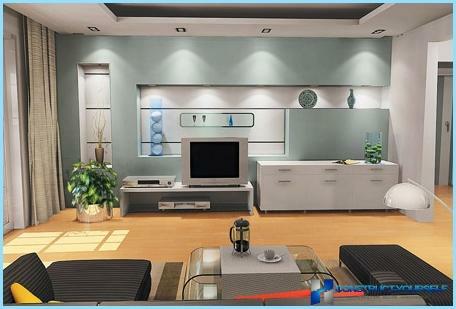 If the room is high ceiling, it will install tall cabinets, the full height of the wall. Many articles and books are rarely used in everyday use, easy to place on the top shelf, they will not interfere too evident. 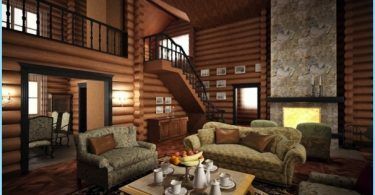 The same applies to sofas: preference is given to a graceful even un- or a small sofa, which will not block the space in the room. Massive volume and soft corners or sofas - not a suitable option. Quite fresh and original solution steelsofas, window sills. This will not only free up more space in the room, but will be quite practical solution: under the hinged cover of the sofa you can arrange additional storage. A small room of 17 square metersIt has to be well covered. Do not decorate the windows and heavy blackout curtains. Better to hang light and transparent curtains through which will pass the sunlight. Another good option - Venetian blinds on the size of the window opening. For this reason, should not be to focusattention to the design window. Not recommended to be put on the windowsill flowers or other items. An interesting variant, visually expand the space of the room - arched windows. As the lighting preferenceis giving a built-in fixtures and not pretentious and heavy chandeliers hanging from the ceiling. An exception may reach a situation where the room is decorated in a minimalist style, and a large and massive chandelier becomes the main focus of the interior. Although, of course, we should not completely disregard their own preferences, clearly following the guidelines laid down. In any case, the opportunity for improvisation should always remain.